There are some hikes that just have to be done. When deciding between the myriad of trails in Acadia National Park, Cadillac Mountain is a must. Though only 1530 feet, Cadillac is the highest point on Mount Desert Island, offering stunning views in all directions. 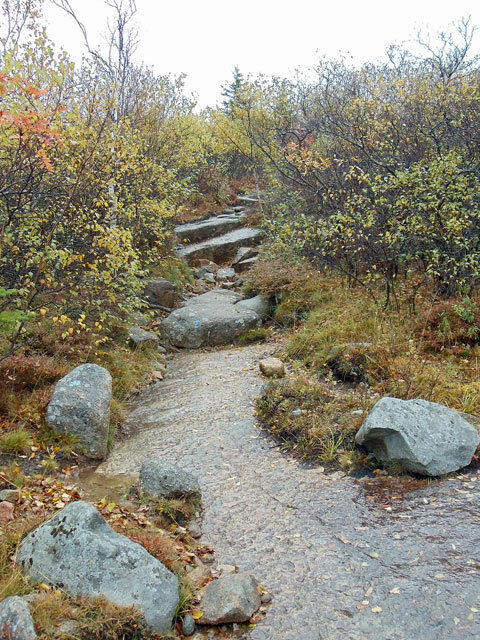 With several trails to pick from, we chose the North Ridge Trail for our ascent on a rainy day in October. 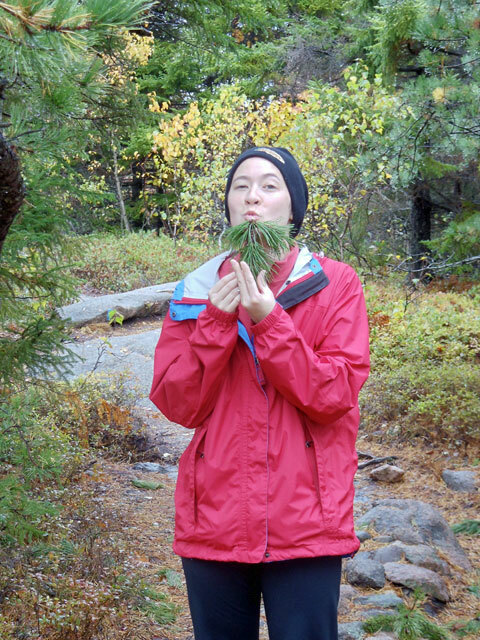 In my mind, May and October are the only two months worth hiking Acadia. Any time in between and you risk being overrun by human locusts more commonly known as tourists. The North Ridge Trail is a good one for children in fair weather. The climb is gradual and most of the trail is easy going on exposed granite. There was only one spot I used my hands to pull myself up and this was no more difficult than climbing into a full-size truck. In all seriousness, the most difficult spot just might be the initial bank off the road. 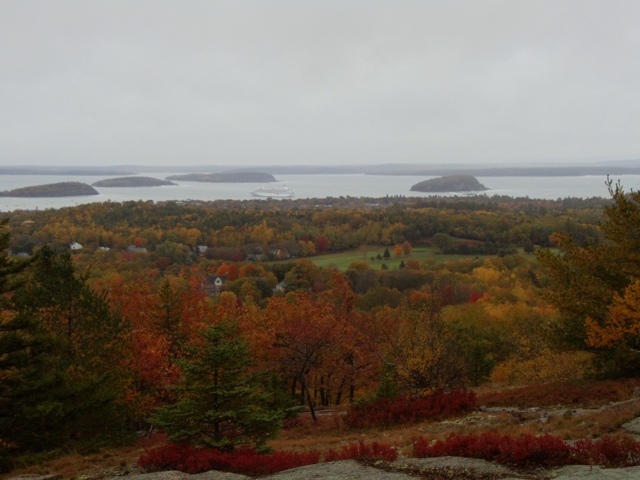 The trail features numerous scenic lookouts over Frenchman Bay in Bar Harbor, as well as interesting groves of stunted pine fit for a hobbit. The one negative is that the trail often parallels Cadillac Mountain Road and the peaceful soundtrack of Mother Nature is frequently remixed by the whirl of passing cars. In one spot the trail passes within camera shot of the tourist paparazzi at a scenic lookout. The tree line on Cadillac is much lower than inland mountains and a good portion of the final ascent is all open rock face. I kept expecting a last steep climb to the summit but it never came. You’ll know you’ve reached the top when you get to the parking lot, unfortunately. From here there is a short loop trail around the summit. There are also a couple of connecting trails on the summit, with connections off the connections, providing an array of options for continuing throughout the park. We chose to descend via the Gorge Path. Of course, taking a pedestrian route to the top means you’ll have guilt-free calories to replace. I recommend the create-your-own mac and cheese at the Side Street Cafe in Bar Harbor. A great view of Frenchman Bay from the very beginning of the trail. Frantastic’s trail goatee. Important to note that no wildlife was harmed in the making of this blog post. A typical stretch of trail near the tree line. Even with all the rain, the trail wasn’t very slippery. The exposed rock surface was more rough and honeycombed than smooth. Into the great white ocean. 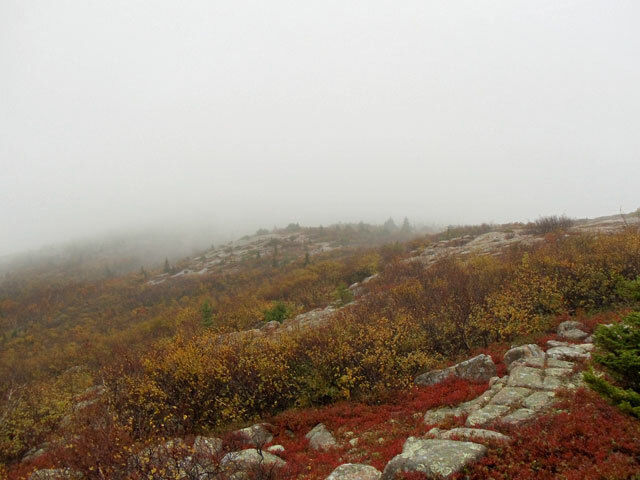 Even a cold and rainy day on the North Ridge Trail beats a warm Bar Harbor pub with a seasonal pint, burger, fries, football on TV…wait, what’s my argument again? 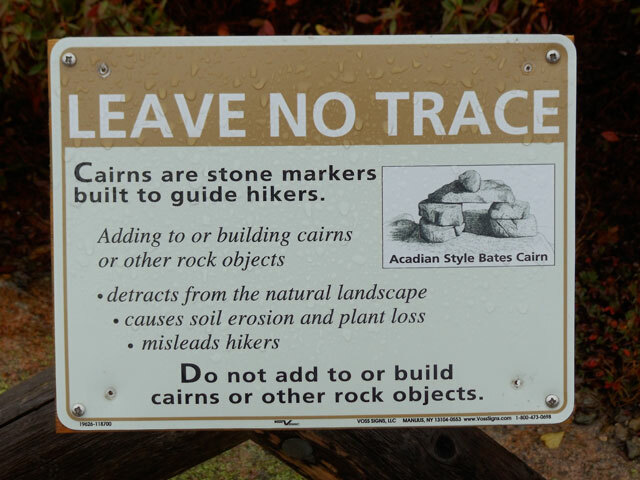 Gotta love national parks…and stupid people. 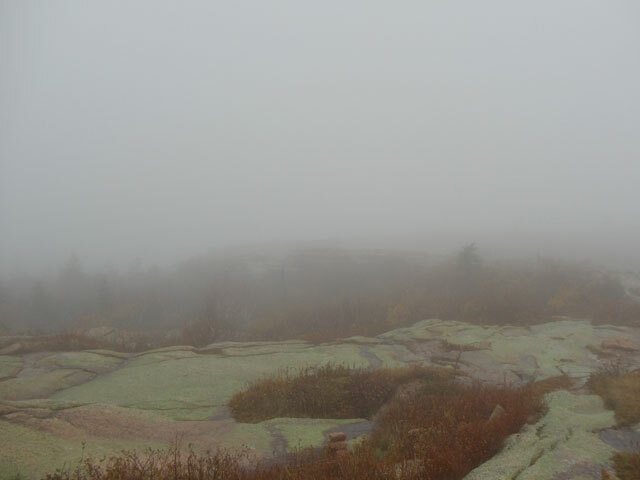 Maybe it’s just me, but the Cadillac Mountain summit view seemed overrated. Take I-95 in Maine to exit 182A and merge onto I-395 east. From I-395 take exit 6A and merge onto U.S. 1A east to Ellsworth. From Ellsworth follow U.S. 3 east to Bar Harbor. The entrance to Acadia is well marked, and upon entering the park follow signs for the Park Loop Road (not the Cadillac Mountain Road). The North Ridge Trail head is reached prior to the fee gate. Parking at the trail head is limited so arrive early, especially in the summer. If you’re planning a full day of hiking in Acadia, it’s best to stop at the visitor’s center to purchase the “Hiking and Biking Trail Map.” It is more detailed than the free park map and worth the $4.95 investment.